Read-out Instrumentation Signpost: Panel mounted connectors. Cliff Electronics' comprehensive range of market leading FeedThrough (FT) connectors, supplied in the industry standard 24mm diameter XLR panel cut-out, now includes the very popular CAT3 RJ11 and RJ14 connectors offering users a panel mount option. The RJ11 and RJ14 are the most widely implemented connectors in telecommunications and commonly used for token ring and simple 10Base-T networks providing 10 megabits per second (Mbps) transfer rate, operating at 16 megahertz (MHz). 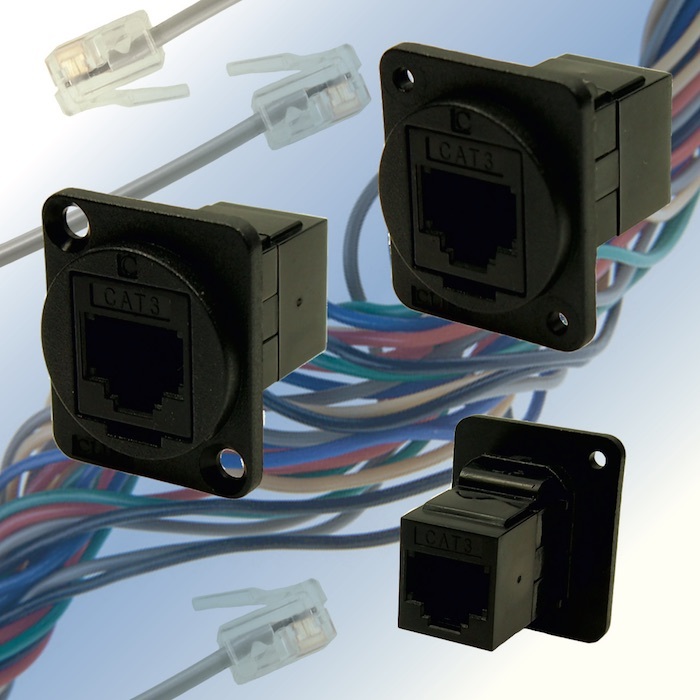 The Cliff CAT3 RJ11 and RJ14 connectors are true feed-through with connections both sides of the panel made using standard off the shelf cables with matching plugs pre-assembled. Versions are available with plain or countersunk mounting holes to facilitate assembly on either side of a panel. The CAT3 RJ11 and RJ14 6P4C connectors can be incorporated in pre-assembled 19” rack panels together with other types of Cliff FeedThrough connectors to meet bespoke connectivity requirements or make patch panels. The Cliff FT series of true, feed through, data connectors for electrical and electronic instrumentation are perfect for developing custom I/O configurations for wall plates, enclosures, rack panels, etc. All fit within a standard XLR panel cut-out and use common standard cabling for front and back connections with no soldering or screw terminal connections required. FT connectors may be mounted from the front or back of a panel and a low rear profile accommodates the tightest behind-the-panel spaces. Pre-assembled 19” rack panels fitted with a range of FT and standard connectors are available from Cliff to simplify end system assembly. Cliff’s XLR format FeedThrough connectors take advantage of the standard 24mm panel cut out widely used in audio and broadcast systems and which is finding increasing popularity instrumentation, medical and industrial applications due to the format’s flexibility, security and reliability. Blank socket plates are also now available for customers to create custom connector solutions. Versions available include GJ45, HDMI, BNC and USB3.0 compliant single and dual USB versions in addition to the existing range which provides Analogue, Digital and Optical Feed-Through connectivity in formats including Firewire, HDMI A-A and metal or plastic 50 ohm BNC versions, USB2 A-to-B and B-to-A “gender change” sockets high speed USB Type – C, USB3 to USB3 in all gender changing configurations - A-A, A-B and B-A. Also available are all popular data and Ethernet connectors including USB 2.0 and 3.0, LC and SC fibre (Duplex & Simplex), UTP and FTP RJ45s in both Cat6 and Cat5e (shielded and unshielded), Toslink, RCA Phono and HDMI and blanking plates. Dust covers are now available for many of the connector range.